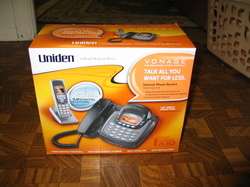 Uniden came across my rant on my Vonage hang-up fast-busy problem and they noticed I was using a Uniden 5.8GHz TRU8885-2 phone system. 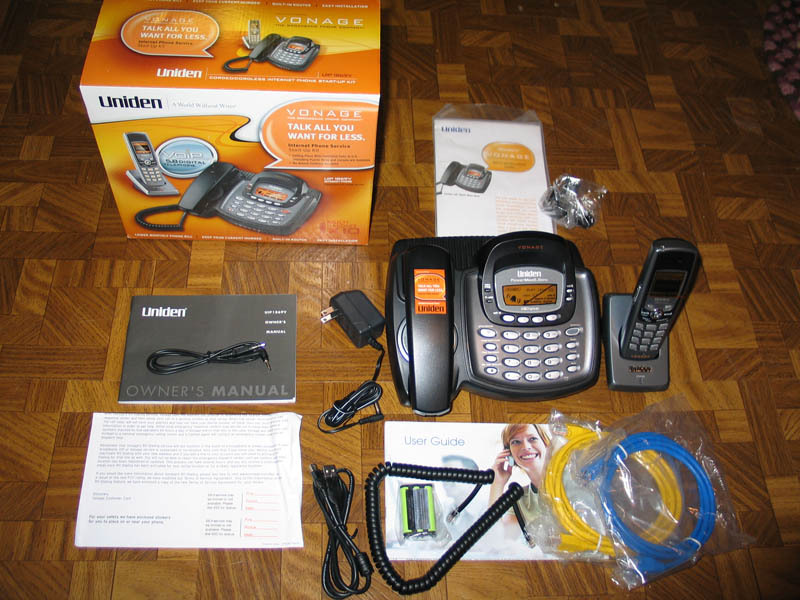 They offered to send me a Uniden UIP1869V which is nearly identical in functionality to the TRU8885-2 with the added bonus that it comes preloaded with support for Vonage. They also sent me a Uniden UIP160P Packet8 Compatible 5.8GHz phone system which I will review at a later date. 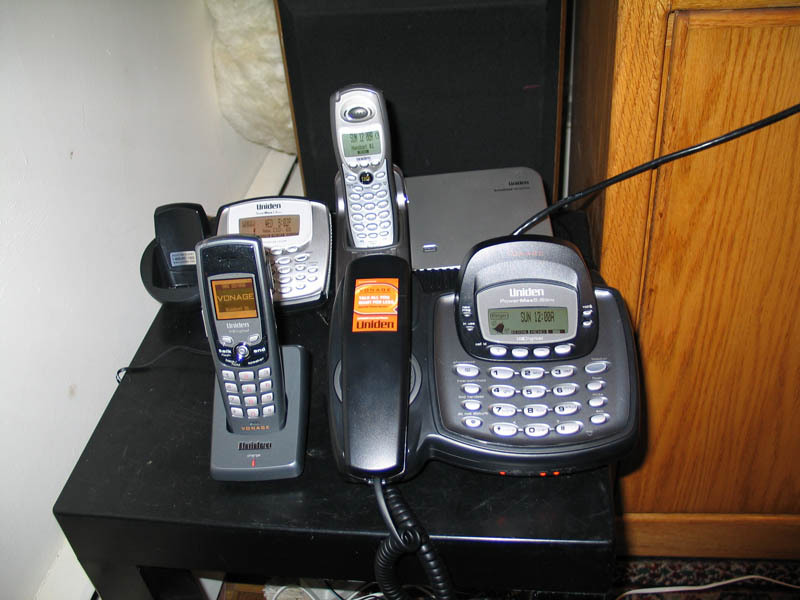 I actually almost purchased the Vonage-enabled UIP1869V but the base station on the UIP1869V is corded - not cordless and I prefer cordless phones for all of my phones. Of course, both the TRU8885-2 and the UIP1869V both support up to 10 handsets, so I could have chosen the UIP1869V and simply purchased an extra handset. In any event, let me tell ya, the Uniden UIP1869V isn't your momma's home phone system! Nope, this bad boy features a built-in fully-featured firewall (click screenshot to right to enlarge) with DHCP server, Dynamic DNS, port forwarding, and other typical firewall features. "Who puts a firewall in a home phone system?" is what you're probably thinking. Perhaps you are even thinking it's overkill or that it's redundant since most homes already have a firewall. Well, the benefit of the Uniden phone system having a firewall is that it can do packet prioritization of the voice over data if you place the Uniden UIP1869V in front of your existing router/firewall. Interestingly, I only knew this because I asked Uniden about it. The manual makes no mention of QoS. In fact, the installation instructions recommend you install the Uniden phone system + firewall behind your existing router/firewall which would disable the QoS feature. If your existing router/firewall can't perform QoS, this is a poor topology to use. You won't have the benefit of Uniden's QoS capabilities. Thus, if you are a heavy Bittorrent, eMule, or another P2P client, you can drastically affect the quality of your voice connection due to the data intensive nature of P2P software. Simply downloading or FTPing a file can also affect a VoIP call's quality, so the QoS feature is a nice thing to have. I suspected Uniden didn't want to make the installation too complex for Average Joe consumer, which is why they didn't promote or mention the QoS feature in the documentation, so I asked Doug King, Product Manager for Uniden. Doug King stated: The VoIP service provider's world is dominated by customer support issues and they go to a ton of trouble to avoid calls. By not telling anyone about a feature that really should be on all the time, they avoid questions like "What does this button do?" and "I pressed this button and X stopped working." It's a survival strategy. Vonage does not mention QoS on their site in relation to their product. If they do have a customer with a quality of service issue (something easily determined with just a few questions) then they tell them to use the topology you mentioned below (Placing the entire home network behind the phone or TA) to fix the issue without ever telling the consumer that QoS fixed the problem. This issue rarely comes up. To the VoIP service providers the biggest technical issue is setting up the TA/Phone as a PPPoE client. Their recommended topology takes this into consideration ABOVE QoS. From the conversations I've had with them it seems they found this out the hard way. With this phone you get plenty of Vonage documentation, including a Vonage voicemail cheat sheet guide for navigating the voicemail system, those lovely e911 stickers that you're supposed to stick on your phones, Vonage contact information sheet, and of course the Vonage user's guide. The Uniden UIP1869V features a SIP proxy for connecting to Vonage, 5.8Ghz digital signal with 10,000,000 random digital security codes, speakerphone, two analog FXS ports for connecting analog phones, fax machines, etc. Some nice usability features include the ability to set a periodic voicemail beep when you have new messages, the ability to set any key to answer a call, and the ability to set Call Privacy so that other handsets don't listen in on your outbound call. Other features include illuminated keypads, hold/mute/redial, built-in pager so you can locate your handsets, a "do not disturb" message, 20 built-in ring-tones, adjustable ringer and volume control, and anonymous call rejection. Another nice usability feature is the ability to set a banner to each handset to help identify the handset. 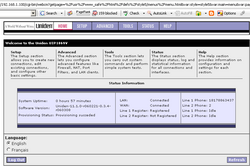 My TRU8885-2 phone system is very similar in functionality to the UIP1869V and supports the banner feature. So for example on my three Uniden handsets I set the banners to the name where each handset belongs, i.e. FAMILYROOM, KITCHEN, BEDROOM. This not only makes it easy to know where each handset should be returned to charge, it also makes it easier to perform intercom calls from one handset to another. My wife uses the intercom feature to call the FAMILYROOM handset which is usually where I am either watching TV on my 65" TV screen or doing some computer-related stuff. Any time your wife doesn't have to scream to get your attention is always a good thing! ;) The Uniden TRU8885-2 already paid for itself in stress reduction - the UIP1869V no doubt would do the same. In addition, you can also intercom page to all the handsets and whoever picks up first is connected to the person who paged. Installing the UIP1869V VoIP phone system was a snap. The only snafu was the included Ethernet cord was too short (5 feet) to reach my Internet router, but fortunately I have several 10' and 25' Ethernet cables in my home from various networking testing projects. I can't knock Uniden too much for not including a longer cable since most networking products come with a 5' cable. The power supply is pretty big, though I neglected to take a picture of it. I didn't realize it was hidden in the bottom of the box until after I took the photos. Suffice to say, I had to get another power-strip just so I could fit the power supply. In any case, below is a picture of the installed setup. 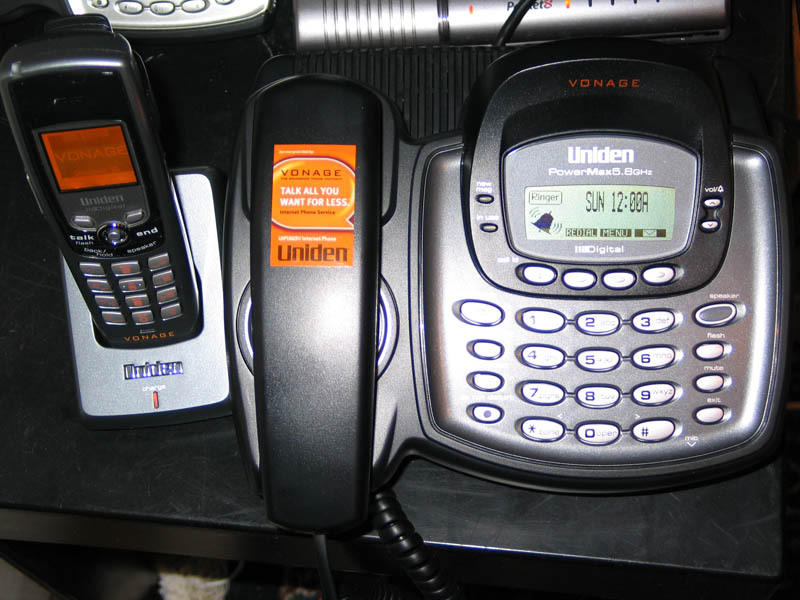 You'll notice I have several Uniden phone systems configured side-by-side, including the Uniden UIP1869V (Vonage), Uniden TRU-8885-2 (my own analog/digital phone system), and the UIP1868P (Packet8). I also have a Packet8 videophone on the floor which is out of frame. I get to play with all the cool VoIP toys! Now let me point out some cool features. 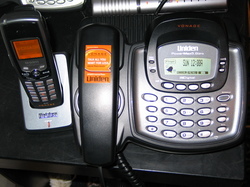 First, the Uniden phone has a message waiting indicator light on both the base station and the handsets which integrates with Vonage's voicemail service to determine when you have new messages. Another cool feature of the included Uniden cordless handset is that you can download up to 5 distinctive ringer tones up to a total of 100 seconds from any music source (CD player, stereo) using the included audio jack. So feel free to 'pimp' your Uniden phone with some music clips from Creed, Metallica, Journey, Eminem or whatever suits your fancy. After downloading the ringer tone you can associate a title to the ringer tone and then associate a specific CallerID with a specific ringer tone. On a related note, you can also download your own wallpaper image to the handset or choose from the 34 included wallpaper images. Another cool feature is the remote baby monitor which allows you to listen in on any room where a handset is located. I already have a video baby monitor for our baby's crib, but having a second baby monitor for other rooms in the house comes in handy. All of the handsets come with a belt clip so you can attach the phone to your hip and monitor your baby throughout the house. Or you can go James Bond or NSA-like and covertly spy on your fellow family members. You can also use the phone in Direct Link mode which turns the handsets into walkie-talkies that works even when away from the base unit. One minor complaint I had was that the Do-Not-Disturb feature can only be activated from the base station and not from the handsets. Thus, if the base station is on another floor in your home, you'll have to walk to the base station to enable/disable the DND feature. The UIP1869V base and the handset lets you store up to 400 numbers (100 names with four numbers per name) and it features a 100-Caller ID and phone book memory. There is no shared address book amongst the phones, however you can easily copy an entire address book or a single contact record to a single handset that you select. If you want to copy to another handset you'll have to do it one-at-a-time. This is a nice feature, but I wish I was able to push an address book to all of the handsets simultaneously. 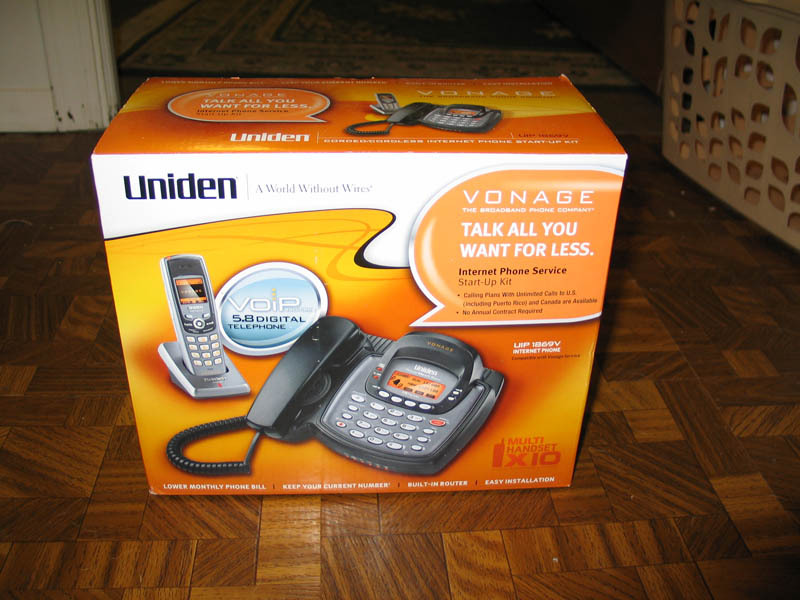 Overall, I was very impressed with the Uniden UIP1869V Vonage phone system. Although I did have some critiques of the system, they are merely suggestions to improve the product. It is a very feature-rich and capable phone system. 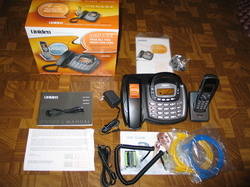 In fact, of all the multi-handset wireless handset phone systems I have looked at, the Uniden UIP1869V is the system I would now choose for my own use, had I not already recently purchased the Uniden TRU-8885-2 from Amazon. Pricing: $189.99, however it is currently available on Amazon for $99.99 after rebate. No shared phonebook. Each handset has its own phonebook, thus you have to enter in your contacts into each phone or use the copy feature. Power supply is pretty big. In any event, let me tell ya, the Uniden UIP1869V isn't your momma's home phone system! Nope, this bad boy features a built-in fully-featured firewall (click screenshot to right to enlarge) with DHCP server, Dynamic DNS, port forwarding, and other typical firewall features. \"Who puts a firewall in a home phone system?\" is what you're probably thinking. Perhaps you are even thinking it's overkill or that it's redundant since most homes already have a firewall. Doug King stated: The VoIP service provider's world is dominated by customer support issues and they go to a ton of trouble to avoid calls. By not telling anyone about a feature that really should be on all the time, they avoid questions like \"What does this button do?\" and \"I pressed this button and X stopped working.\" It's a survival strategy. The Uniden UIP1869V features a SIP proxy for connecting to Vonage, 5.8Ghz digital signal with 10,000,000 random digital security codes, speakerphone, two analog FXS ports for connecting analog phones, fax machines, etc. Some nice usability features include the ability to set a periodic voicemail beep when you have new messages, the ability to set any key to answer a call, and the ability to set Call Privacy so that other handsets don't listen in on your outbound call. Other features include illuminated keypads, hold/mute/redial, built-in pager so you can locate your handsets, a \"do not disturb\" message, 20 built-in ring-tones, adjustable ringer and volume control, and anonymous call rejection. Another nice usability feature is the ability to set a banner to each handset to help identify the handset. 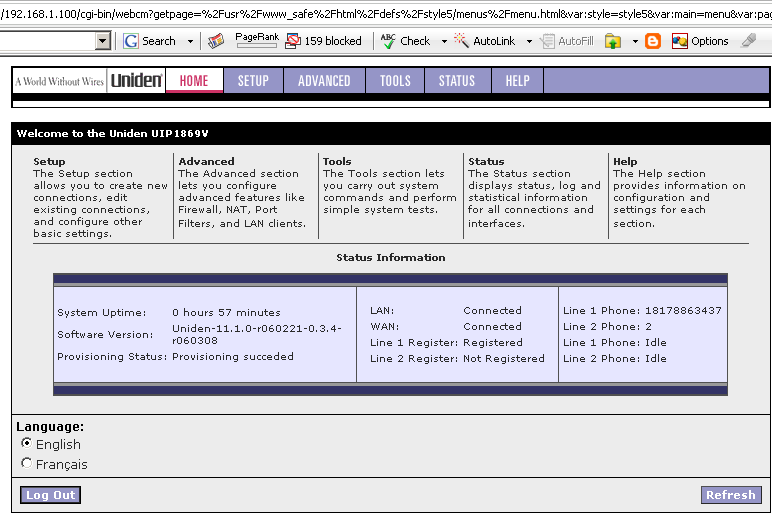 My TRU8885-2 phone system is very similar in functionality to the UIP1869V and supports the banner feature. So for example on my three Uniden handsets I set the banners to the name where each handset belongs, i.e. FAMILYROOM, KITCHEN, BEDROOM. This not only makes it easy to know where each handset should be returned to charge, it also makes it easier to perform intercom calls from one handset to another. My wife uses the intercom feature to call the FAMILYROOM handset which is usually where I am either watching TV on my 65\" TV screen or doing some computer-related stuff. Any time your wife doesn't have to scream to get your attention is always a good thing! ;) The Uniden TRU8885-2 already paid for itself in stress reduction - the UIP1869V no doubt would do the same. In addition, you can also intercom page to all the handsets and whoever picks up first is connected to the person who paged. Pricing: \$189.99, however it is currently available on Amazon for \$99.99 after rebate.